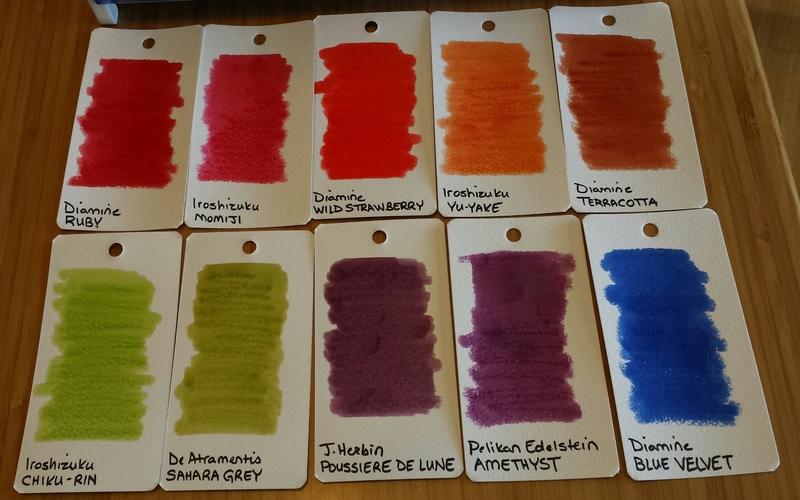 New Ink Samples! Ordered just because I’ve wanted to try them. Diamine Ruby – nice deep red, aptly named. Iroshizuku Momiji – leans towards pink, pretty though. Diamine Wild Strawberry – crazy, when wet I swear it looks orange! Diamine Sahara Grey – umm, where’s the grey in here? Pelikan Edelstein Amethyst – a richer more vibrant purple, but looks really similar to Poussiere de Lune here. Diamine Blue Velvet – positively electric, but still not as much as Noodlers Baystate Blue.